Cashew, Anacardium occidentale, is native to the tropical forests in Northeastern Brazil. 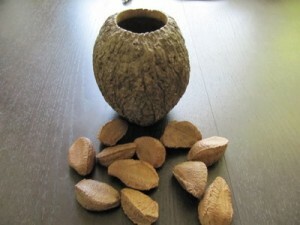 The nut is actually a seed, but because it is attached to a pseudofruit, it is called a nut, which sounds nonsensical. The Portuguese named the fruit of the cashew tree, “caju,” from the indigenous Tupi word, acajú. The tree is now widely grown in the tropics for both the nuts (seeds) and the cashew apples (pseudofruit). The cashew is a small evergreen tree growing to about 35 feet. The cashew apple is actually an “accessory fruit” or false fruit (pseudofruit) that grows from the receptacle of the cashew flower. As it ripens, it becomes yellow or red, is fragrant, sweet and juicy, but extremely fragile, so it is not found in markets far from the source. It is used in aguas frescas. The true fruit grows beneath the cashew apple and looks like a kidney bean or boxing glove attached to the apple. Inside the fruit is the cashew seed. Talk about confusing! The seed itself is surrounded by a double shell that contains urishol, the same irritant found in poison oak and ivy. As a result, the people who work husking the cashews must wear protective gloves. Cashews are now grown in the tropics worldwide. One tree produces between 200 and 300 pounds annually. Vietnam is the biggest producer of cashews, followed by India, Nigeria, India and Brazil. Cashews are very popular as a snack, as well as in cuisine. Cashews can be soaked, then ground into a delicious vegan cream. Cashews are used in both sweet and savory foods in areas where they are grown, as well as roasted, salted and eaten out-of-hand. Both the cashew and the liquid that comes from the outer shells are used in ethno-medicine. The liquid is anti-bacterial and useful for treating tooth abcesses. The nut oil is a good anti-fungal. The bark is boiled and used as an anti-diarrheal, and the nuts (seeds) are ground up and used as an antivenon for snake bites.